Earlier photo gains credibility as a new version makes an appearance. 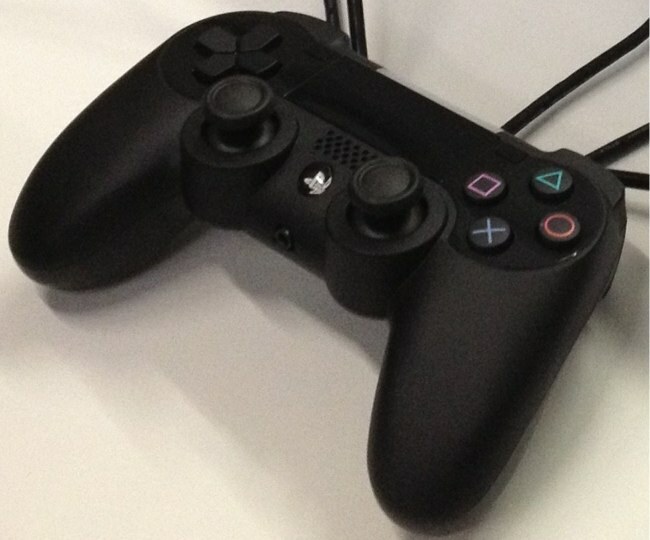 We first brought you word of the rumored PS4 controller photo yesterday afternoon, and it hasn't taken long for a second image to emerge. This one appears to have originated on the GameTrailers forums, where an anonymous poster has "confirmed" that the controller is indeed that of the PS4. This supports other reports from across the web where trusted insiders have spilled the beans on the new design. Showing what appears to be the same design as the first device, this photo offers a new angle, showing thicker controller grips as well as the now clearly-visible start/select buttons located to the top right and top left of the touch surface. The top light bar is also present, just as it was in the original image, further supporting default motion control functionality. As we can now see from the new photo, the controller appears to have a textured look on the grips and body, with a shiny, polished surface surrounding the touchpad, analog directional pad, and face buttons. It's interesting to note that the glossy black accent matches the front of the PS Vita perfectly. A small port on the bottom of the device suggests headset compatibility, while the speaker (or microphone... or both) remains situated right in the middle of the controller. As with yesterday's photo, this controller appears to be wired, possibly pointing to it being a prototype device for developers. So there you have it folks; This is one rumor that is really starting to heat up. Of course, we can't make a definitive call until we see it first-hand, and straight from Sony - but for what it's worth, it's looking better than it was yesterday.